You can say that I am the embodiment of the American dream. My father. Mother, sister, and I came to the US in 1955 on an old World War 2 troop ship, the USS General Langfitt. Between 24 November 1954 and 30 April 1957 she made 32 voyages from New York to Bremerhaven, Germany, and back, carrying European refugees to the United States under the Refugees Relief Act. I was part of this story. We were very fortunate in that Chicago had a large immigrant support network at the time. Not only did they help us with housing, and finding jobs, it was also a large social network. Because few immigrants owned cars, every Sunday, a chartered bus would take us to a picnic or museum that we could otherwise not easily get too. Because we started out early and the drive was sometimes an hour, a priest would hold mass on the bus. We have all heard about the nuns on the bus. Well, back then we had priests on the bus. There was collection bag next to the driver. Everyone put in something as they got on. Two or three times a year, our group went to a huge picnic up in the Chain-of-Lakes area. Busses came from different neighborhoods of Chicago and the suburbs. Some, as far away as Milwaukee. There were lots of activities for the kids. But the really big thing was the all day, round robin soccer matches between the different buses (neighborhoods). That was some serious business. There was a lot of great food at these picnics, imported European kid drinks (ie. Himbeersaft which is a popular raspberry drink), and beer. Lots of beer. The bus rides home were as much fun as the picnics. It is where I learned to sing “99 bottles of beer on the wall” in both German and English. There was no wall but they did pass them around. The collection bag was mostly symbolic and I think everyone knew this. The few dollars in the bag came nowhere near what these events must have cost. They were really paid for by fellow immigrants, who had found success and had not forgotten how it was other immigrants before them that had helped their families get a start in the US. But our family also lived the immigrant nightmare. We had rocks thrown through our windows during the night on several occasions. My mother’s garden was repeatedly trampled until she finally gave up. 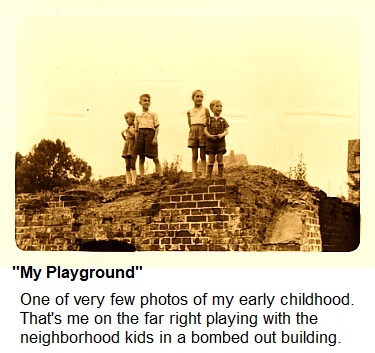 My sister and I were constantly harassed by a handful of neighborhood bullies. When they were in their group and we walked past them, they would snap to attention, click their heels, and do the “Heil Hitler” salute. They wanted us out of the neighborhood. In time, the frequency of the harassment declined but never really ended. The harassment just became more random. Most surprisingly, what eventually put an end to the nightmare was that the neighborhood began to change. We lived close to Grant Hospital in Chicago. I watched it transformed from a relatively small hospital to a big medical complex. Naturally, doctors, nurses, and other well paid hospital workers wanted to live near work and the neighborhood became very multicultural. Grant Hospital had staff of every nationality imaginable and some rather odd combinations them too. Naturally, the area became a cultural paradise. My God, the restaurants and food stores that popped up. I think about how boring our country would be without the multitude of cultures all around us. We are all immigrants. It is immigrants that made our country great. We may need immigration reform, but Trump’s wall is definitely not the answer. Not too long after reaching adulthood, I got the urge to see the Statue of Liberty. I knew that we had all come on deck to see the Statue of Liberty as our ship passed by upon our arrival in New York. But I had no childhood memory of seeing it myself. 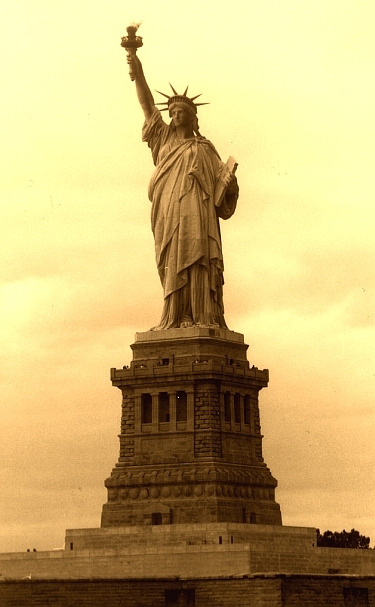 So, In 1986, I made a pilgrimage to see the Statue of Liberty.